Get your caffeine fix with our rich coffee ice cream with espresso chips. Guaranteed to be tastier than your morning cup o’ joe! 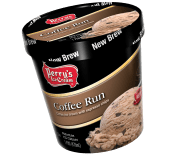 MILK, CREAM, CORN SYRUP, LIQUID SUGAR, ESPRESSO CHIPS [SUGAR, COCONUT OIL, COCOA (PROCESSED WITH ALKALI), COCOA POWDER, COFFEE, SALT, SOY LECITHIN, NATURAL FLAVOR], SKIM MILK, BUTTERMILK, NATURAL FLAVOR, MILKFAT, WHEY, MONO- AND DIGLYCERIDES, CELLULOSE GUM, GUAR GUM, CARRAGEENAN, DEXTROSE, EGG YOLKS. *Coconut Oil is highly refined.